The City of Boston’s financial position again earned the highest ratings from Moody’s Investment Services and S&P Global in 2019. Moody’s reaffirmed its highest bond rating of Aaa for Boston, which was first awarded in 2011, and S&P Global affirmed its AAA rating, which was first awarded in March 2014. For the first time, both rating agencies cited the risks of climate change in their ratings reports. In 2018, S&P raised climate change, particularly sea level rise, as one of the major long-term credit risks facing the City. Mayor Walsh has said the City will commit 10% of capital spending to resilience projects, beginning with the FY20 budget. 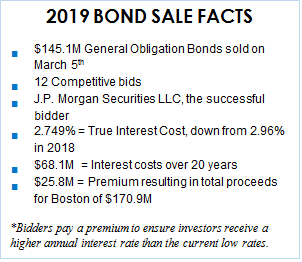 Funding Capital Spending – Based on the FY19-FY23 capital budget, Boston is expected to issue general obligation bonds totaling $1.02B over the five years, but not increase debt service costs beyond its standard of 7% of the City’s operating budget. Debt service represents 5.8% of the City’s approved FY19 operating budget. As the Research Bureau has noted previously, Boston has the financial capacity to increase its debt service to generate funding for its long-term initiatives. *Based on February 2019 Moody’s and S&P Global credit reports.